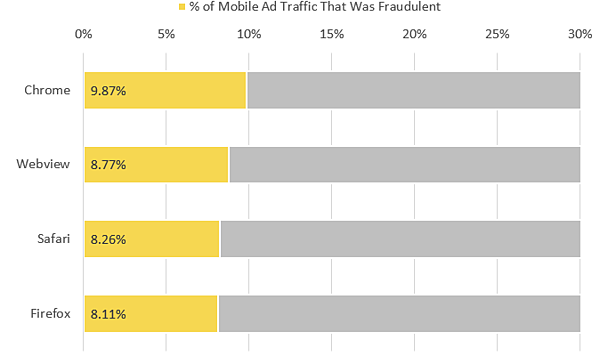 In our last post, we discussed ad fraud from a regional perspective, and before that we gave a general global overview of fraudulent ad traffic. Now we're breaking down our ad traffic data by browser to reveal which browsers have the highest percentages of fraudulent ad traffic. Data from multiple versions of each browser is included. A PDF of our Ad Fraud Browser Report for September 2018 is provided in the link below. As a refresher, these results stem from the analysis of digital ad traffic from September 2018. Our pixel-based technology regularly monitors data from over 640 million unique users, 1.2 billion unique devices, and 12 million URLs monthly. We map the latest devices, locations, bots, behaviors, and hacking tactics that are being used by digital fraudsters. The fraudulent percentages reported here represent ad traffic determined to be generated by malware, bots, compromised devices, and other nefarious means, rendering it fraudulent. The rate of fraudulent traffic can vary considerably depending on which ad traffic variable you're looking at, and browsers are no exception. Below are breakdowns of how much ad traffic was seen by each browser and the percentages of fraudulent traffic within the browsers. 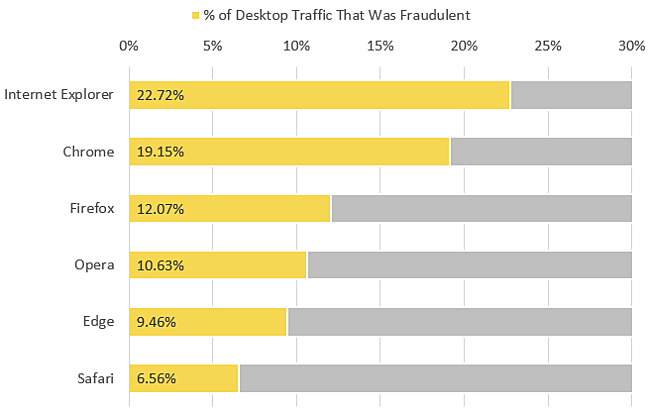 65% of all ad traffic was from Chrome browsers, 14% of that was fraudulent. The greatest volume of ad traffic observed came from Chrome browsers (65%), followed by Webview in-app browsers (18%), Safari (9%), Firefox (3%), Edge (2%), and Internet Explorer (2%). Collectively, these browsers accounted for 99% of all the ad traffic we observed. You can view the breakdown in the chart below. An oldie, but not so goody; riskiest desktop ad traffic comes from Internet Explorer. Looking only at desktop traffic, 73% of it was from Chrome, 9% Firefox, 6% Edge, 5% Internet Explorer, 4% Safari, and 1% Opera - these six browsers accounted for 98% of desktop ad traffic. The graph below shows desktop browser traffic percentages. 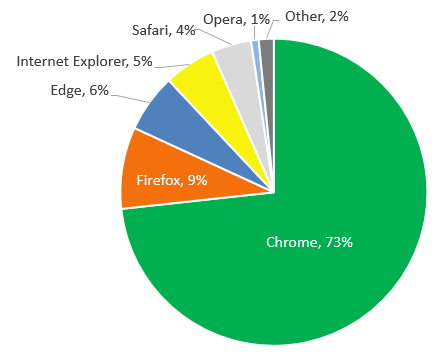 Chrome browsers lead in market share and fraudulent ad traffic. Looking now to mobile ad traffic, a majority of it (61%) came from Chrome browsers. 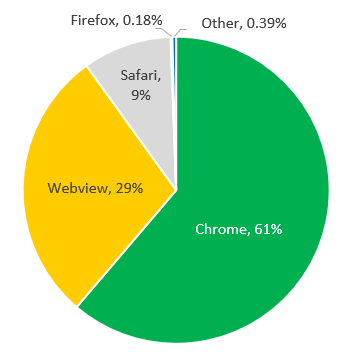 Webview, accounted for 29%, Safari 9%, and Firefox 0.2%. Our Take On This Report. 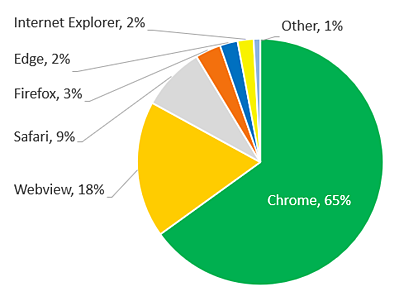 Google’s Chrome browsers have a commanding market share in both desktop and mobile channels. It makes sense for fraudsters to try to take advantage of any vulnerabilities or exploits from these browsers because they lead to the largest pool of potential targets (i.e., fraudsters can create larger botnets to commit ad fraud). Additionally, older versions of browsers (e.g., Internet Explorer) are easier for fraudsters to exploit because they are not getting the same scrutiny and security updates as newer versions and their vulnerabilities are often well known among hackers. As we've demonstrated here, ad fraud rates can look very different depending on what browser you're looking at. In the coming weeks we'll be looking into the ad fraud rates as they break down according to operating systems, mobile, desktop, and more.